Phrontistery:(n) an establishment for study and learning; a thinking place. 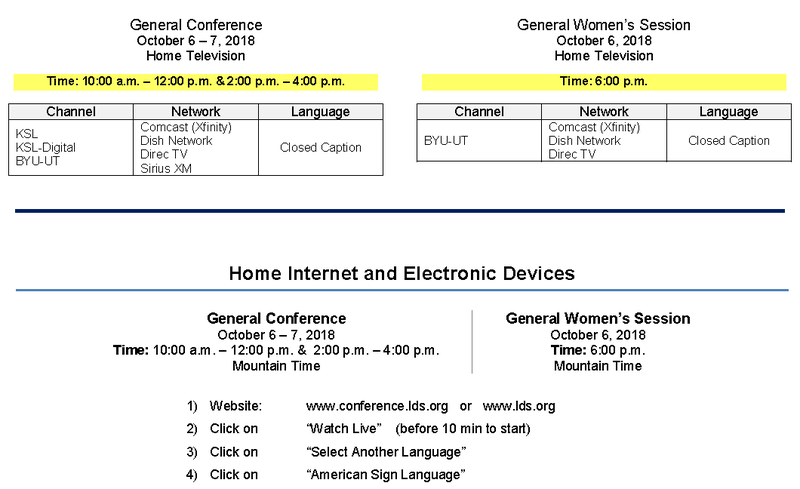 Click on the photo below for a clearer view for when to best view General Conference in American Sign Language. Is The Bible The Source of Truth? Many Christians believe that the Bible is the only source concerning Truth since it contains all the Truth that Christians need to know. As a result, there is no modern need for prophets and apostles. 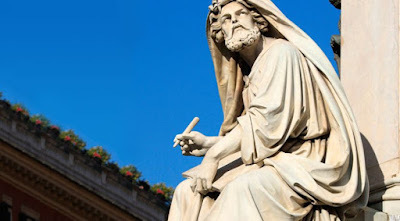 The term “sola Scriptura” or “the Bible alone” is often used to explain that there is only one special revelation from God that man possesses today, the written Scriptures or the Bible. However, the Bible would not be possible with out prophets to write down what God revealed to humanity. Prophets are the medium by which Truth is given to mankind. (Numbers 12:6, Deuteronomy 18:15, Deuteronomy 18:18, 2 Kings 21:10, 2 Kings 24:1-3, 1 Chronicles 29:29, 2 Chronicles 13:22, 2 Chronicles 18:6, 2 Chronicles 24:19, 2 Chronicles 26:22, 2 Chronicles 32:32, 2 Samuel 24:11, Ezra 5:1, Hosea 12:10, Zechariah 1:6, Amos 3:7, Haggai 2:1, Haggai 2:10, Jeremiah 35:15, Jeremiah 37:6, Jeremiah 45:1, Jeremiah 47:1, Jeremiah 49:34, Jeremiah 50:1, Matthew 23:34, Acts 3:22, Ephesians 3:5, Hebrews 1:1, 1 Nephi 19:4, 1 Nephi 22:2, Jacob 5:2, Helaman 13:26, D&C 21:1, D&C 107:92, D&C 124:94, D&C 124:125, and D&C 138:53). As one studies the scripture, it is evident that God has a long-established pattern of calling prophets. Many well-known figures in the Bible, like Noah, Abraham, Moses, and others, were prophets. These men were chosen by God and given authority to lead His people. However, when people chose to ignore God, God took prophets away and waited until the people were ready to listen again. Thus, from the beginning of time emerges a pattern of prophets teaching the people, the people eventually turning away from God (a state called apostasy), and God sending prophets again to show His love and concern for His children. Prophets have always been essential to God's method of sharing His knowledge to mankind as shown throughout the scriptures. God provided prophets to create scripture, and at the same time teach them what had been revealed before, since God's followers did not have access to the scriptures because it would not be "completed" until much later. Thus, the God sent prophets to proclaim His Word to His people to educate those who did not have His Word. Prophets are essential to the religion as established by God. (1 Corinthians 12:28, Ephesians 2:20, Ephesians 4:11, Revelation 11:10, D&C 124:125). The Bible (and other scriptures) contain Truth but are not the source of Truth. The source of Turth comes from God Himself, who reveals Truth to his prophets and these prophets writes down what has been revealed to them. (2 Timothy 3:16–17, 2 Peter 1:20-21). The Old Testament clearly demonstrates that God Himself is the source of Truth and that prophets are the conduit by which Truth is revealed to humanity. For example, King Jehoiakim had attempted to destroy God's Word by burning a roll written by Jeremiah. Yet, the Lord instructed Jeremiah take a new scroll and rewrite the words that were destroyed. (See Jeremiah 36: 27-28). However, not only did God have Jeremiah restore what was destroyed, but the Lord told him there were additional information (revelation) to write about on top of what was previously written before the King burned the roll. This concept is also illustrated in the New Testament as well. For example, the Paul recived a revelation that the gospel should be taught to the Gentiles and not just the Jews. (Acts 10:1-48; 11:1-18). This revelation was then recorded as evidence that God still uses prophets to guide His people, even after Christ's death. We also see this concept throughout the Book of Mormon. God gives specific instructions to His Prophets on what to write down and/or what not to write down. (see 2 Ne.4: 15, 2 Ne. 29: 11-12, 3 Ne. 27: 23-24 and 3 Ne. 28: 25). The above scriptural examples from the Old Testament, New Testament and the Book of Mormon repeatedly show that the Bible itself is not the sole source of Truth. God is the source and inspiration of the scriptures and that the scriptures would not be possible without the prophets. There's no evidence that God shut the heavens and intended for mankind to only have the Bible. God frequently speaks to mankind via prophets thoughout history as evidenced by the scriptures and continues to do so today. There are some Christans who have argued that the closing verses in the Book of Revelation, (specifically Rev. 22:18-19) cap off the Bible and define all the preceding Books as inspired by God. That is not possible because the Book of Deuteronomy contains similar verses (4:2 & 12:32). The only logical conclusion that the reader of the Bible can make is that God frequently revealed His Word to his Prophets throughout the Old and New Testament and that He continued to reveal Truth to people in other parts of the globe such as to those prophets in the Book of Mormon. God continues to provide revelation to His Prophets even today. Another piece of evidence for prophets continuing after Christ's death is that Jesus warned that there would be many false prophets that would come after his death and that the followers of Christ should learn to discren who is a true prophet and who is not. (Matthew 7:15, Matthew 24:11, Matthew 24:24, Mark 13:22, 2 Peter 2:1, 1 John 4:1). Interestingly enough, God warned about false prophets in the Old Testament too. (Deuteronomy 13:5, Jeremiah 14:14-15, Jeremiah 23:21, Jeremiah 27:14, Ezekiel 13:3, and Matthew 7:15.) The Book of Mormon has a similar warning about false prophets as well. (Helaman 13:27). It is clear that separating the true prophets from the false prophets have always been a problem in the Old and New Testament, as well as the Book of Mormon, and that it would continue into the future until Christ returns again. The important lesson here is that scriptures are clear in showing that God is the source of Truth and He will verify who are His true prophets. These true prophets are authorized to share what He has revealed for all of mankind. The scriptures consistently teach that God is the source of Truth, the Prophets are the medium by which God reveals Truth to mankind, and that the scriptures (the Bible, the Book of Mormon, the Doctrine and Covenants, and the Pearl of Great Price) are a record of the Truth that God gave to his prophets. God still speaks His Truth to us today through His Prophets and his message is currently being recorded, preserved and shared in multiple mediums such as books, magazines, media and the Internet. Although the 2016 October General Conference has just ended a few hours ago, the biggest news about the LDS Church may not be about what was said during General Conference, but what the Church leaders have said behind closed doors away from public view. Someone has uploaded videos of internal discussions among senior leaders of the LDS Church on YouTube account called "Mormon Leaks." These videos show Church leadership being briefed on a variety of topics such as YSAs & Marriage, politics, and marijuana. After each presentation, they talk about the impact these topics could have on the LDS church. Two of those videos will be of interest to those who are young single adults in the LDS Church. One video shows Church authorities receiving a presentation on the topic of single Mormons delaying marriage. Another video shows the Brethren sharing their concerns about the young single adults in the Church. The LDS Church has quickly put out a response to today's leak. Their response is below. LDS church spokesperson Eric Hawkins said in a statement to 2News, "Most of these videos appear to be from briefings received by senior Church leaders between 2007 and 2012. In these committee meetings, presentations are routinely received from various religious, political and subject matter experts on a variety of topics. The purpose is to understand issues that may face the Church, and is in pursuit of the obligation Church leaders feel to be informed on and have open discussion about current issues. This is an informational forum, not a decision-making body." The Brethren work hard to stay informed and current on the issues of our day. It appears that these meetings is just one way they work to stay informed about current events and issues that are of interest to the LDS Church. The videos of the Brethren talking about YSAs are available below. Elder Patrick Kearon, of the quorum of the Seventy, gave a moving talk about the Church's call to help refugees during the Sunday afternoon session of the April 2016 General Conference. Many Mormons were clearly moved by his talk. However, there were many of Mormons who felt conflicted about his talk. I can see this conflict in debates among members of the Church after General Conference on social media sites. Before I explain the conflict felt by many members in the Church, I want to make it clear at the beginning that we are all for helping refugees. We fully support the Church's efforts in mobilizing members to gather food, water, clothing, bedding, and bags full of sanitary items so that they can ship it to refugee camps in the Middle East and Europe. Elder Kearon's talk certainly pulled at our heartstrings. Elder Kearon raised the valid point that Christ himself, at one point in his life, was a refugee when his parents fled to Egypt when he was a little child. He talked about how Mormons were refugees when they were forced to flee from place to place by angry mobs and ultimately had to leave the United States to find peace beyond the western frontier of the United States by moving into what was then Mexican territory. We know that many in the Church were once refugees. We clearly heard the call to be compassionate and charitable towards refugees that are escaping war, famine, and economic uncertainty in their homelands. It was clear that Elder Utchdorf was moved by Elder Kearon's talk afterwards. Elder Uchtdorf talked about being a refugee prior to Elder Kearon's talk in General Conference. However, many members couldn't help thinking about the ongoing political debate in America and in Europe about letting refugees into their homelands during his talk. Many of us were thinking about how Europe suffered repeated terrorist attacks because they allowed people to come into their country without asking any questions about who was coming in. Elder Kearon didn't mention anything about opening the borders and letting as many refugees in as possible. His talk simply focused on the need for members of the Church to help the refugees. He explicitly stated in this talk that his desire was to focus on refugees themselves and not on immigration policy or the debates over the definition of a refugee. Yet, many members were torn between having compassion for these refugees and the desire for security against terrorism by refugees coming from certain parts of the world. Clearly, the hot topics of immigation, terrorism, and other issues came to mind to some people when they heard this talk even when Elder Kearon explicitly stated that he would be avoiding these issues. Correctly or incorrectly, some people got the impression that we should sacrifice our desire for safety and security in the name of compassion. Many of us have a legitimate concern about sacrificing security for compassion by opening up our borders to people who wish to do us harm. The United States government, through both the FBI and DHS, have admitted that we have no way to verify who is coming into our country. Many members of the Church want to help the refugees, but they have a legitimate concern about their safety not being compromised while helping others. We fully acknowledge that not every refugee is a terrorist bent on hurting as many as possible. Refugees do flee from all parts of the world to come to places of safety. Not all of refugees come from the Middle East. But some of the terrorists did come into Europe during the large wave of refugees who came from the Middle East last summer. And this fact certainly is still a presence in many people's minds. Its clear that the recent events in Europe have affected some people's reception of Elder Kearon's talk. Under different circumstances or had the recent terror attacks not occurred, the response to his talk would have been more universally accepted. Instead, many people felt conflicted about his talk. Many debates erupted on social media sites about the issue of compassion versus security. I don't know how to resolve the conflict between the call for compassion and the legitimate desire for personal safety while helping others. I don't know what the answer to that problem is. I felt this conflict while I listened to his talk. I confess to having participated in these online debates on various social media platforms. I have been reflecting on this inner conflict and thinking about the points raised by both sides. I decided to write this post to ask the readers for solutions on this conflict. I don't want a debate. I want answers. I want to be Christlike but I also want to protect myself and others at the same time. How can members of the Church balance their desire for compassion and safety? Is such a balance possible? 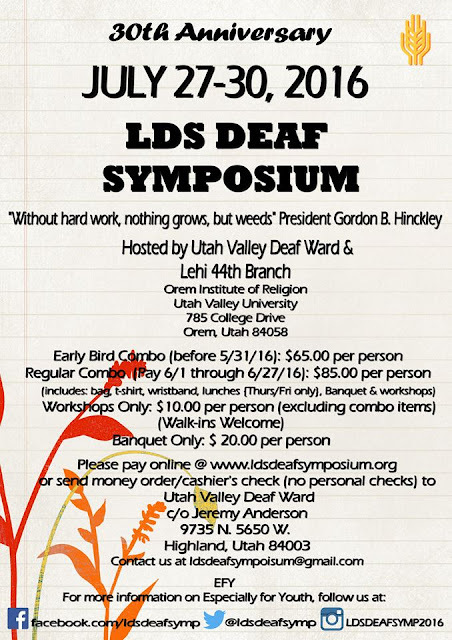 The LDS Deaf Symposium is a great way for Deaf and Hard of Hearing members of the LDS Church to gather together to be spiritually strengthened and to form connections with one another. Those who know American Sign Language are also invited to come. The dates for the 2016 LDS Deaf Symposium have been announced and online payment is now available. More information is available in the flyer below. General Conference is coming upon us again soon! As always, I am providing the broadcast schedule for Deaf and Hard of Hearing individuals who wish to watch Conference in an accessible format. See below for information on how to enjoy General Conference. If you have trouble viewing the infographic below, click on it and download it for better viewing. 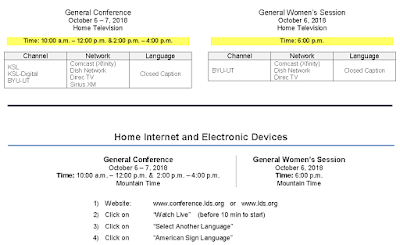 UPDATE: This has been updated to include more information about how to view General Conference in ASL. UPDATE #2: We received word from many members trying to view the ASL interpretation for the General Women’s Session this past weekend that it was difficult to find the ASL interpretation on lds.org. We’ve done some research and it seems ASL and all other languages available through the language drop down menu have been removed from the main English broadcast page. All languages will now be shown on their individual language pages. This means that you need to go to lds.org/asl to find the ASL interpretation of General Conference. It will appear between “American Sign Language” and “Scriptures” on the page captured below. Sorry for this confusion. Please help us spread the word.